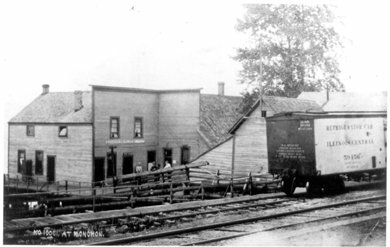 This 1909 photograph shows the Allen & Nelson Mill Co.’s office at Monohon. The Monohon Post Office also is located in the building. On the tracks at the right is an Illinois Central Railroad refrigerator car. This car makes for an interesting topic of discussion, as one might wonder what was delivered to Monohon that required the constant cooling from large blocks of ice.